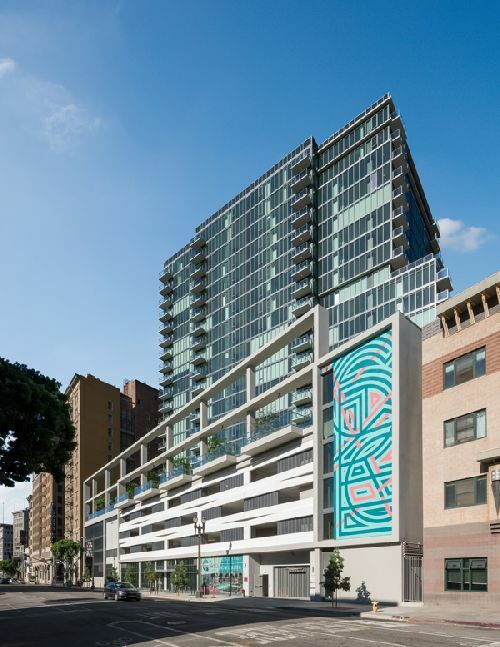 Holland Partner Group Wraps Up Work on Two High-Rise Res Towers in Downtown L.A.
Holland Partner Group (HPG) has completed work on two high-rise, mixed-use developments in downtown Los Angeles. The two projects - The Grace and The Griffin on Spring -- are located at the intersection of the Historic Core and Fashion Districts at 8th and Spring St. Both developments were designed by architectural firm MVE + Partners. The 24-story towers include a mix of studios, one-, two- and three-bedroom apartments. The Griffin on Spring is comprised of 275 residential units above 9k sf of ground floor retail, while The Grace on Spring consists of 300 units above 7.5k sf of ground-floor retail. Both towers feature luxury amenities including observatory rooftop lounges, a fitness center with separate yoga studio, business center and conference rooms, resort-style swimming pool and an entertainment lounge with kitchen, bar, media, billiards and more. The Griffin on Spring’s design was drawn from the historic context of the neighborhood, with the use of metal, cast stone and other elements incorporated in a 150 foot traditional street wall that aligns with the classic style of Los Angeles circa 1920. Above 150 feet, the design embraces modern materials such as glass and steel, symbolizing the transition from the old to the new world and offering panoramic views of the Los Angeles skyline through floor-to-ceiling glass windows. Similarly, The Grace on Spring’s architecture also includes a 150-foot traditional street wall, however, it features a unique weaved-fabric pattern as an homage to fashion design. Above 150 feet, the window wall façade also offers sweeping views of downtown Los Angeles.